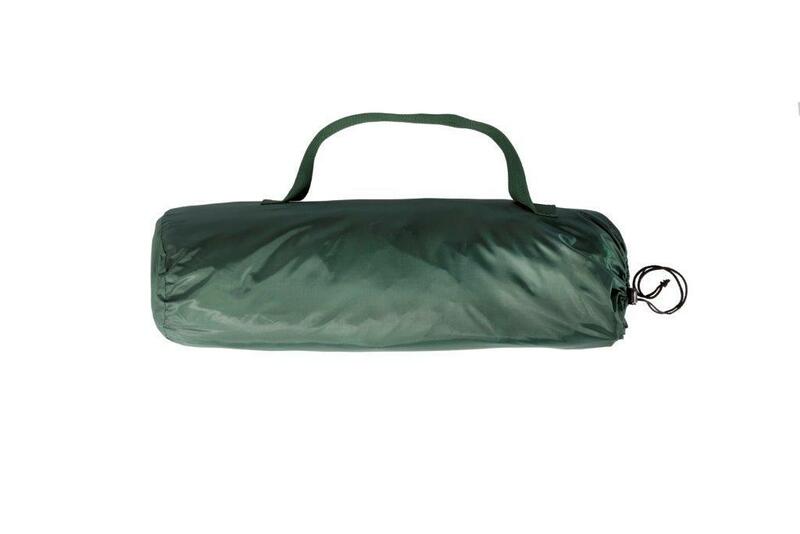 With its extended width and length, the CTC XL was designed for extra comfort. 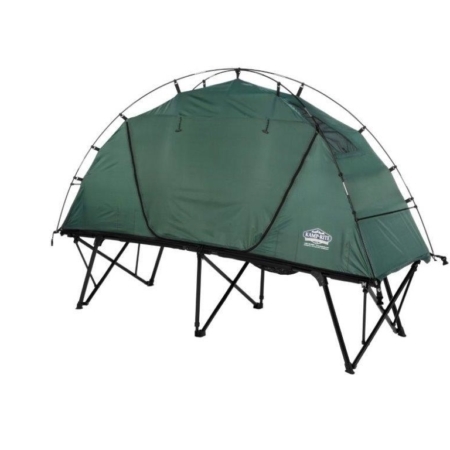 The CTC XL includes the 3-in-1 features of the CTC Standard—two separate, standard camping items (a tent and a cot) that combine to create a comfortable off-the-ground sleep shelter. 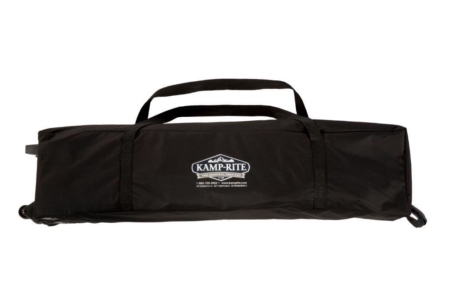 The Kamp-Rite® CTC XL was designed for extra comfort with its extended width and length. 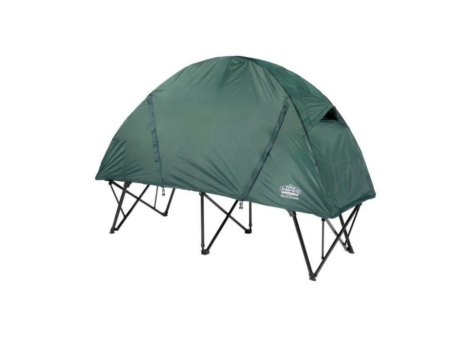 The CTC XL includes the 3-in-1 features of the CTC Standard—two separate, standard camping items (a tent and a cot) that combine to create a comfortable off-the-ground sleep shelter. 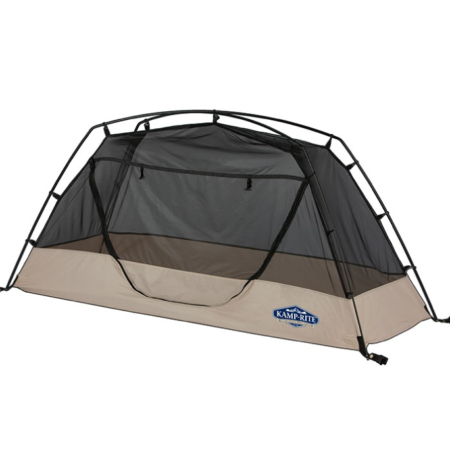 The CTC XL’s sleeping area has plenty of head room and its two zippered windows at each end promote air flow on warm nights. Spreader bars located at each end of the tent top keep the top fully expanded for maximum interior space. 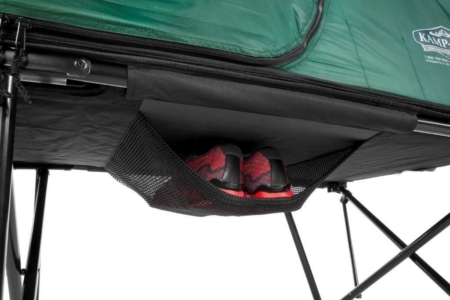 The CTC XL folds down to a compact and portable size, providing an appealing alternative to old style, cumbersome camping gear. The CTC XL takes mere minutes to set up, leaving you more time to relax on even the shortest of outings. Each CTC XL comes complete with a Kamp-Rite® Rain Fly and a convenient, Roller Wheeled Carry Bag. Weight Rating Recommendation of 350 lbs. I recommend the CTC XL for anybody up to about 6’2″. I want to address some of the complaints I’ve heard. Condensation because of dew can be a problem, so I always use the rain fly with it’s gables. It is important that these gables aren’t crushed when folded into the crush sack. I also use plastic struts in the gables that I cut 7.5 inches long to let exhaust air out. Never zip the door along the bottom edge, this lets fresh air in. I also use clothes pins to regulate the rain fly door opening. Use these tips and the CTC XL will be versatile enough for almost any conditions.. 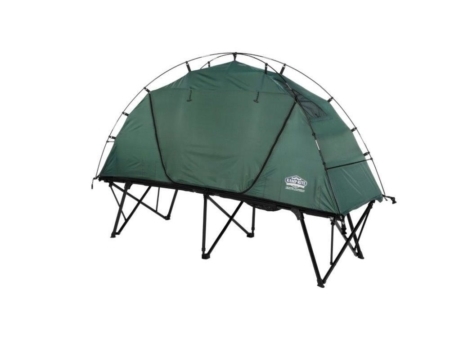 I have recently used my CTC XL in high winds, gusts to 35 mph, with no effect on the tent. I did use bungee cords as hold downs. I also woke up to a tropical rain storm, reached up, released the clothes pin holding the rain fly door, zipped, and no worries, 10 sec. Max. The zippered tent door was rolled up so ventilation was good with a small tent fan as fresh air could come in along the bottom edge of the door. The vented rain fly is well designed and important to comfort. Took on a 5-Day 350 mile bike trip that had baggage support. Slept in total dry comfort in spite of three nights of rain, one with 40 mph broadside winds and another thunderstorm night where all but about a dozen of hundreds of campers took indoor shelter. One bit of advice, zip up tent door or screen door during rain as rain fly doesn’t seal the bottom well by itself. It was very interesting to be inside the tent cot with 40 mph winds and I could have experience 60 mph on later night if forecast had been correct. 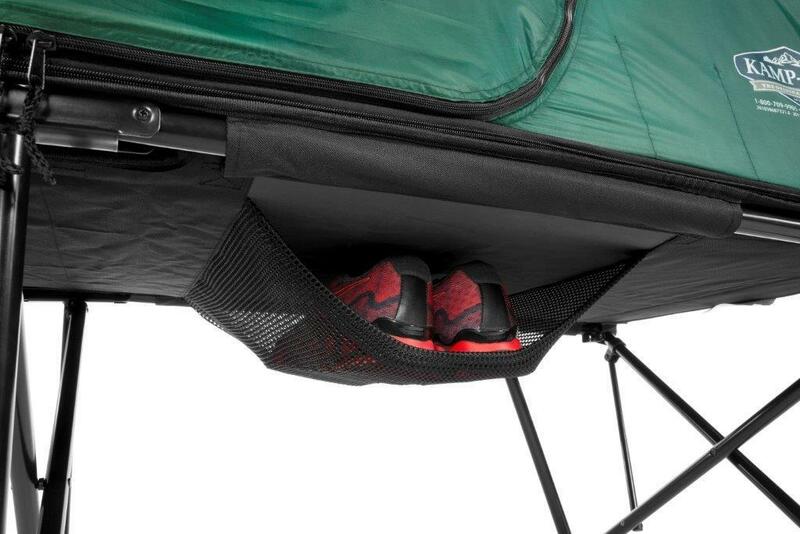 Plenty of room to sleep, store essentials for night and change clothes in the morning. So I buttoned up for the night with rain fly and stayed dry to the morning. Nice to be up off the ground as several onground tents were flooded. I wasnt’ sure how being elevated might make things worse for winds during storms but I survived when some other tents didn’t by anchoring for the night. 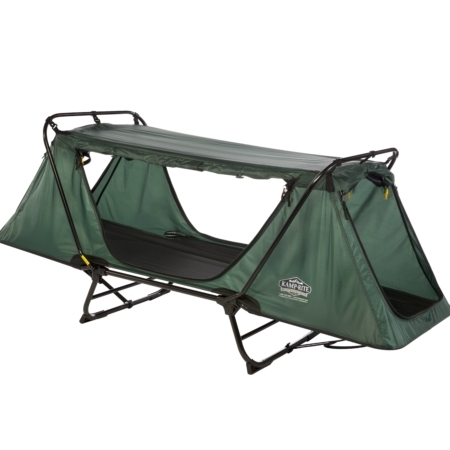 Had many people wanting to see the tent cot for their own use so it was a popular attraction on the campground. 6. Possible rain fly outward extension to cover you while entering or leaving during rain since the side slopes dramatically and lets rain in the tent on entry or exit. 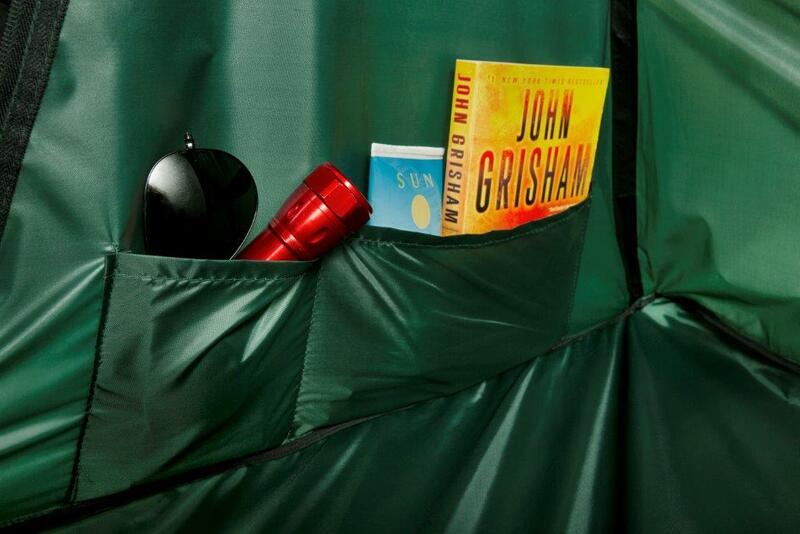 I live this tent. I’m an Observer Couch Training at Fort Irwin CA and I sleep in this tent about 10 days a month. It is great. I have seen a few small problems but nothing to bad since I have owned the tent for almost a year. It has held up to heavy rain in the desert, cold weather in the winter and high winds. I’m 6’2 and there is enough room for me to have all my clothes in the tent and i can sit strait up in the tent to change and get ready. 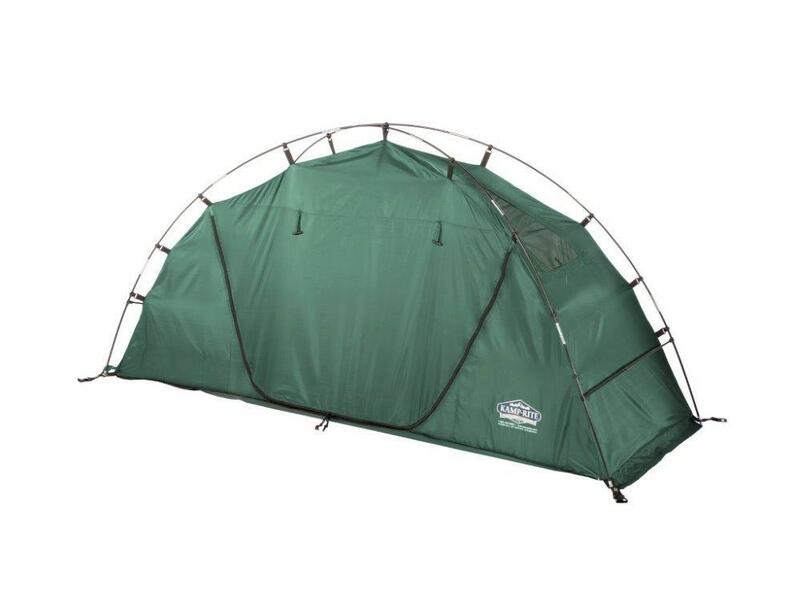 The only problems so far is having a vent in all sides of the tent would be great for when it gets hot. The frame has held up very well but the sleeping area is starting to sag. I weight about 250lbs so that could be part of the problem and I sleep in it a lot. 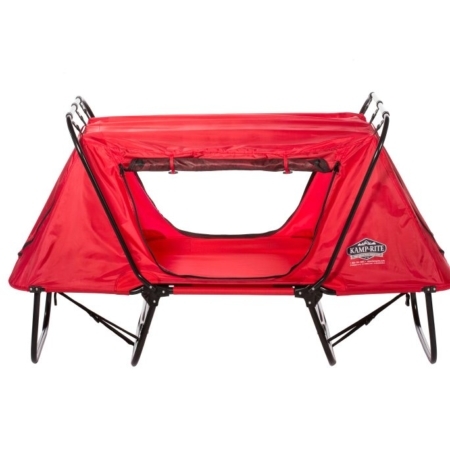 I recommend this to anyone that is looking for a tent cot.